Product categories of Military Rugged Phone, we are specialized manufacturers from China, Military Rugged Phone, Army Rugged Phone suppliers/factory, wholesale high-quality products of Military Rugged Handset R & D and manufacturing, we have the perfect after-sales service and technical support. Look forward to your cooperation! Military Rugged Phone is built to operate reliably in dusty or wet environments and conditions. The Military rugged phones/Bullet-proof Military Tough Smartphone have a thicker and stronger housing compared to a regular phone. US MLD-810G military class certified Corning Gorilla4 bullet-resistant glass for the screen. The Military Rugged Phone is not only anti-skid, shock and water resistant but also resistant to extreme temperature variation and not susceptible to corrosion, fulfilling IP68 world top safety standard. 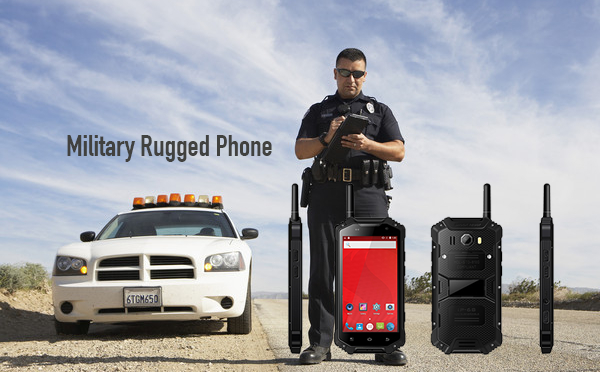 The Military Rugged Phone is mainly used for industrial, construction and military purposes. Yet a Military Rugged Phone is able to comply with other important requirements such as high performance and governmental grade security. The Military Rugged Phone are engineered to be mobile, they are vibration, shock, drop, dust and waterproof. Most Military Rugged Phones are standard equipped with a strap for long-term use and comfortable travel holding. Even the modern-day rugged phones are equipped with a serial port which is commonly used in the industrial and engineering related tasks. The levels of ruggardization are not standardized, but they are measured by various certifications such as MIL-STD-810 or ATEX.